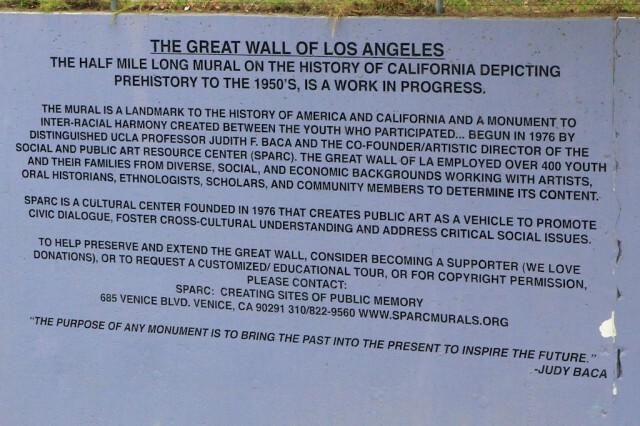 Having lived in Southern California almost all of my life I was really surprised that something like the Great Wall of Los Angeles would be out there without every hearing about it. 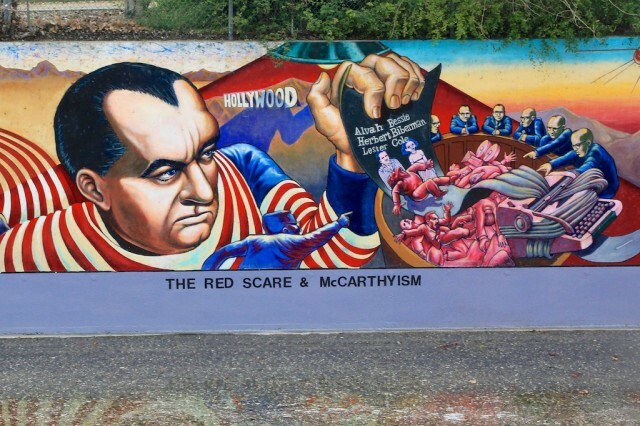 Now I am by no means aware of all the crazy stuff in Southern California, but with something like this I would have thought it would have been referenced at some point in my life. 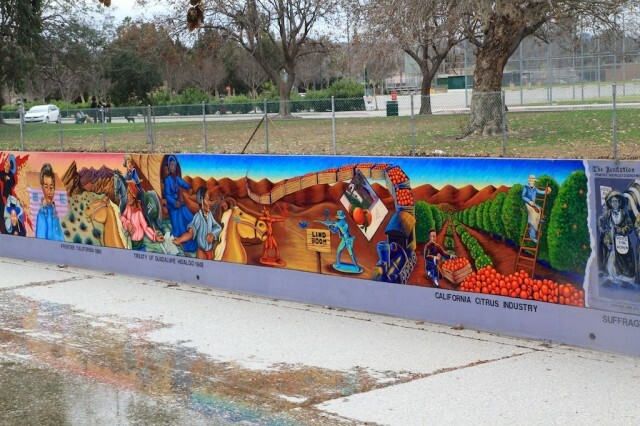 Regardless, when I heard about a half mile long wall of murals (one of the longest murals in the world) that told the history of California, in a water run off in Sherman Oaks, I knew I had to check it out. 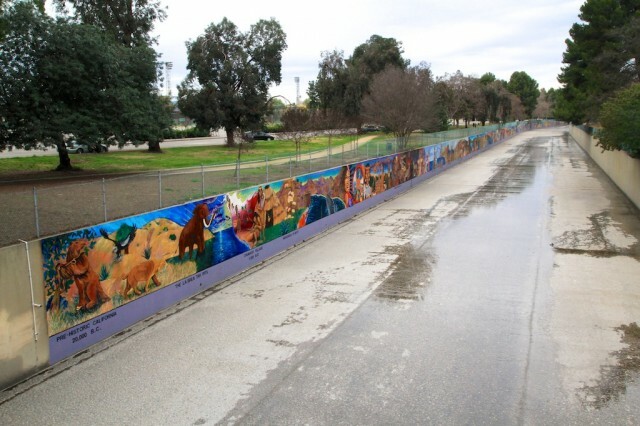 Its half-mile length (2,754 ft) in the Tujunga Flood Control Channel of the San Fernando Valley with accompanying park and bike trail hosts thousands of visitors every year, providing a vibrant and lasting tribute to the working people of California’s who have truly shaped its history. 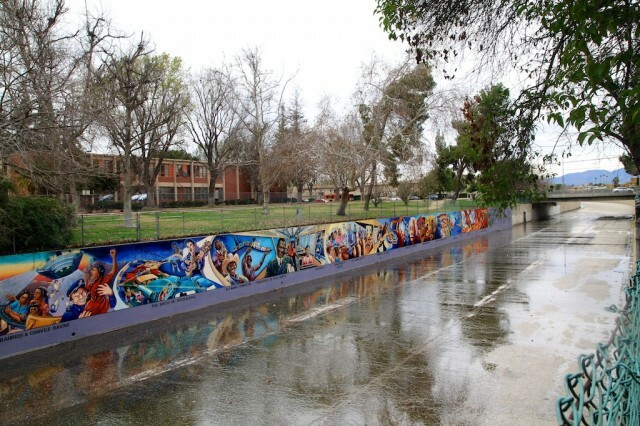 The mural has been flooded five times between 1976 and 1983, with water rising, as high as Edison’s nose,” but it is not damaged by water. 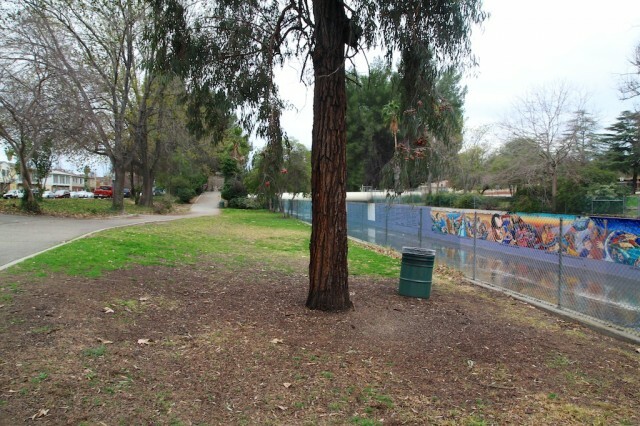 More dangerous is the effect of air pollution, years of exposure to direct sunlight, and fertilizer damage from the adjoining park lawns on the colors. Each section takes a full year to research, organize, and execute. Youth of varied ethnic backgrounds between the ages of 14 and 21 must be recruited and interviewed. 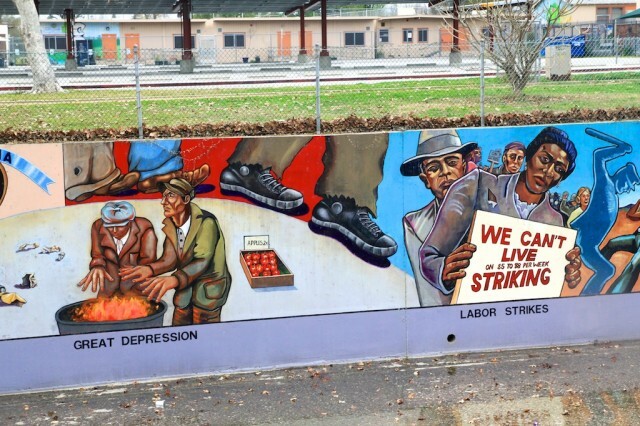 Those selected are employed as assistants and participate in both the planning and execution of the mural. These Mural Makers, mostly from low-income families, are paid through the Summer Youth Employment Program. The youths are supervised by professional artists who work with them four to eight hours a day. They also receive art instruction, attend lectures from historians specializing in ethnic history, do improvisational theater and team-building exercises and acquire the important skill of learning to work together in a context where the diversity of their cultures is the focus. I parked at the top of the wall right near the school on the street and proceeded across the bridge to the start of the dog path. In retrospect I did this in reverse order as I started at the end and went to the beginning but it was still unique. The above picture shows Manzanar, which I wrote about here. 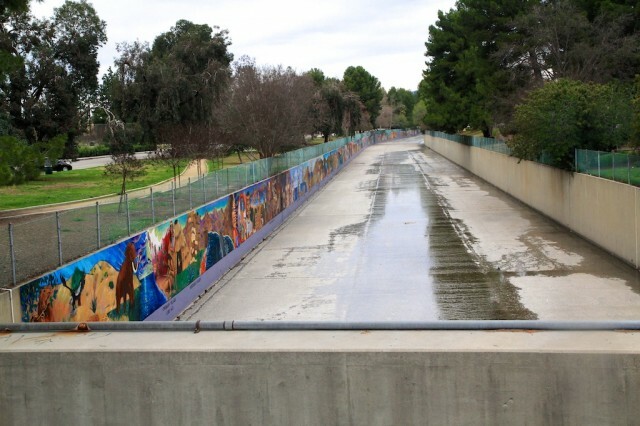 The path is cement and there is a fence about 6 feet tall that stops you from jumping into the runoff area but you can see the murals really well from the path and can get closer to the fence if you want to see a part better. Obviously, you cannot go down and walk along the runoff as if they allowed that I am sure there would be a lot of graffiti and such on the murals, but as long as you have a camera with a decent lens you can get some good shots. 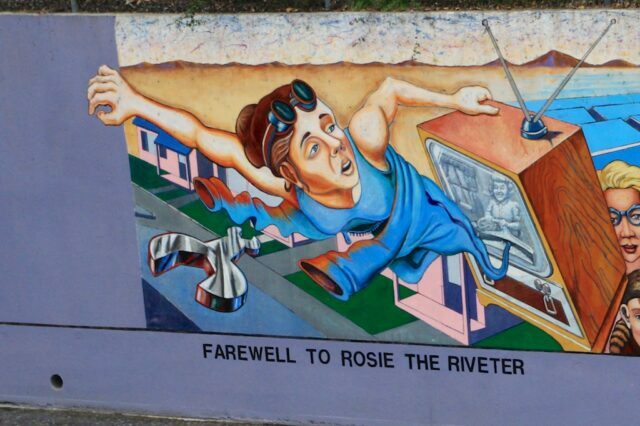 As far as the art is concerned I was blown away by how well done it was and how long the mural really is. Here are some pictures from my walk along it. 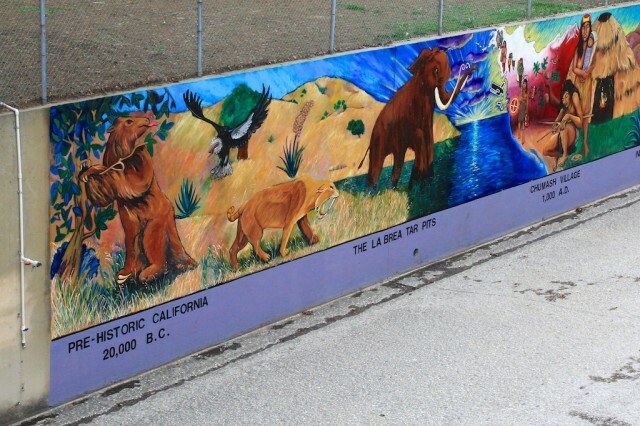 There were so many unique interpretations of parts of California’s history that I really enjoyed myself on the walk. 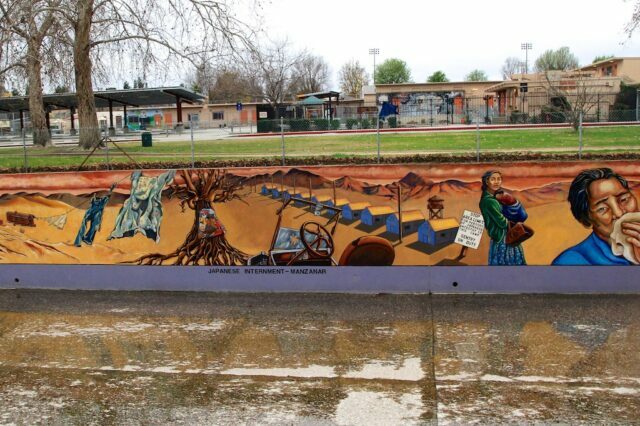 I plan to bring others here as well to experience the history and soak in the beauty of the murals. It’s an added bonus that they allow dogs on the path as well, if you live in this area I imagine this is a great place to walk as you probably see something different every time. 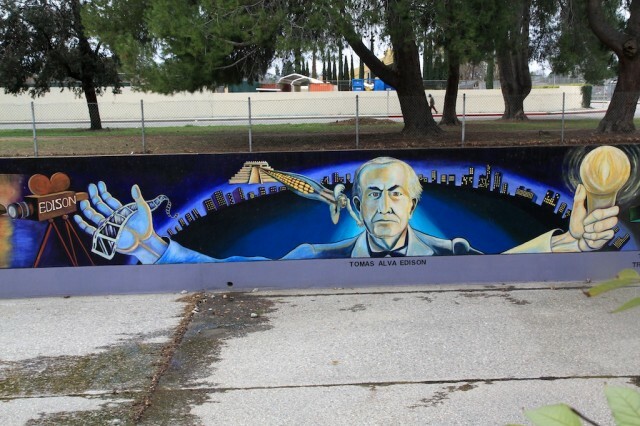 After you get to the end, or the beginning for me, you will really understand how big this mural is. It is a great achievement for those that made it and I cannot wait to see what they add to it next. Get directions to check it out for yourself below and feel free to leave me a comment.